Ericsson VHF- Packet system is active. Kenwood D700, station #1 (delivered in 2003) - Stowed. For up-to-the-minute reports of station status as reported by active hams around the world refer to the ISS Fan Club website. 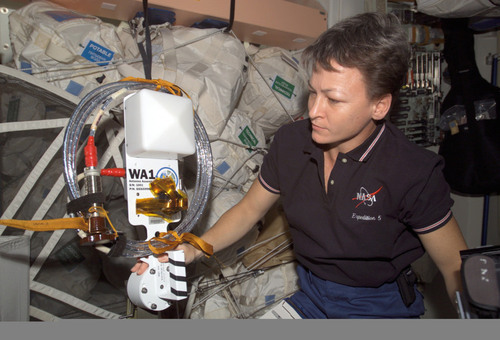 Astronaut Peggy Whitson, Expedition 5 Flight Engineer, holds one of the Amateur Radio antennas prior to installation on the ISS. The antenna is one of a series of four which were clamped on handrails around the Russian Service Module (Svesda). This was done during two different EVA's conducted by Russian cosmonauts in January and in August 2002.